I am watching the sunrise on the Malecon. The Malecon is the curve of road and boardwalk that lines the Pacific ocean, wrapping all the way around the bay-like stretch of land. The sky is dimly lit, all pinks and oranges and a soft dusting of thin feathery clouds slashed across the front of all of it. Behind me are the sounds of Derek moving the refrigerator around. He is trying to find a cockroach. Not just any cockroach. The biggest one I have ever seen. At least three inches long, I was standing in the tiny galley kitchen, making my coffee twenty minutes ago, when I caught a dash of movement out of the corner of my eye. I turned, looked down, and there on the floor was this huge roach. I froze, not knowing what to do, being half-awake, and suddenly afraid of Mexican insects. You always hear that the cockroaches here are big. It is not a myth. I waited to see what it would do, but I already knew I wasn’t going to have the moxy to kill it. That’s when it started running toward me. What!? I ran out of the kitchen and stood over by the stairs, watching it. It turned and followed. I walked slowly over to the door, and it walked slowly after me. Not being very rational or a morning person, I threw open the front door to the apartment and ran down the hall and up the three flights of stairs to the roof and got Derek to come kill it. He was sitting up there reading his Bible. Now, of course, he can’t find it. I hear him move the refrigerator back to its place. I look over and he shrugs. It’s just waiting until you leave so it can come back out and hunt me. He laughs and goes back up to the roof. Meanwhile, Matthew walks out to the balcony where I am sitting with his tiny hermit crab, aptly named Hermie, perched up on his finger like a bird. The crab is only about an inch long, and we found him yesterday as we walked down the Malecon toward a local coffee shop that most of the base people frequent. We will probably have to let him go today or tomorrow, but it is quite neat how the crab just sits there on his finger, sticking out of his shell with his eyes going every which way, his shell resting largely behind him. We have been here for five days. Now, suddenly, the sun breaks over the horizon with all the glory of morning, and the whole view of Mazatlan from where I am sitting is set aglow. Taxis, which look more like large, souped up golf carts than the yellow taxis Americans are used to, zoom up and down the Malecon, taking various people to various places. Palm trees, tall and short, line the roads. Rocks jut out of the Pacific, and from the balcony of the apartment we are staying in, I can see the waves curling over and several surfers sitting upright on their boards in wait of the next set. Our classes start Monday. We have been getting settled and setting up a good homeschool routine for the kids. We’ve been meeting the people here on base, going for walks to explore the town, and asking lots of questions about what will be expected of us here and how things are done. About half the people here on base are Mexican or fluent in Spanish, and the other half come from a combination of places: the States, Canada, Australia, and New Zealand seem to be the main ones. One group of DTS students here is about to leave for outreach in the Philippines. They will be there for the better part of three months. There is a mad scurry as they try to raise the rest of their funds. We don’t know where we’re going on our outreach yet. I’ve heard snippets of conversations about Brazil, El Salvador and Guatemala, but so far, nothing has been announced. Our DTS group, for whom the classes start Monday, will start arriving today. I think there are around thirty of us. We are the only family with children and so have arrived early in order to settle in. Yesterday, we walked across the street to the beach and picked our way over some of the smaller rocks there, exploring the tide pools. 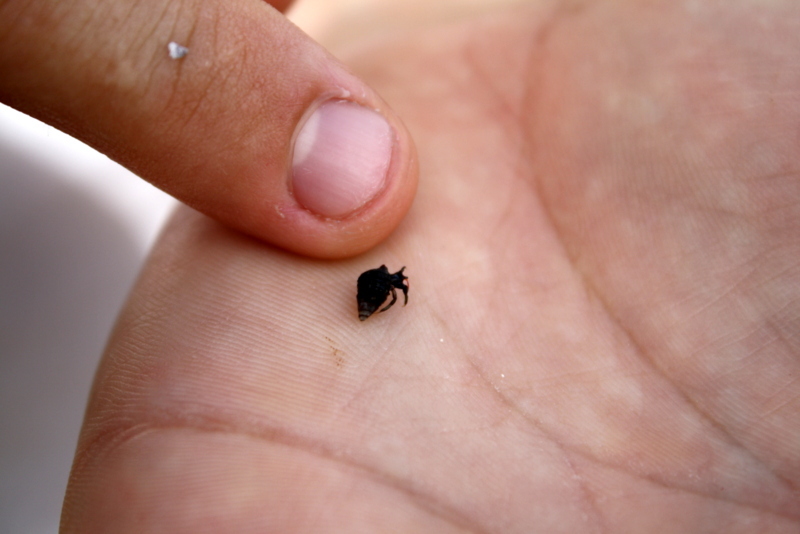 I found a tiny hermit crab, maybe a quarter-inch across, and had it crawling around on my hand for a while. I’d love to go catch a bunch and set them up in an aquarium for the kids while we are here. I find them fascinating. We saw a beached blowfish and Derek used his flip-flops, to the cheers of all of us, to save its life by rolling it down the sand toward the water. We found a sea urchin in the tide line of seaweed up on the beach, and the old shell of another sea urchin. There are many beautiful old buildings here. Already I am picking out my favorite ones from those that jut out precariously over the cliffs, way high up, as we walk alongside the ocean. The conversations that I overhear are interesting, being that they are a collision of cultures and languages. I hear people trying to learn Spanish and English, and everyone here for much of the same reason. To better know God, to better make Him known in their particular “world”. Yesterday I was in the food line for lunch, which consisted of beans, hot dogs and condiments. The ketchup is more of a spiced, “salsa” type of condiment. The mustard is normal, to me at least. They were offering sautéed chiles and onions for the hot dogs as well. One dark-skinned guy stepped up and declined the offering of chiles. The girl serving assumed he was Mexican and said you don’t want chiles? What are you? From Guatemala, he said, totally straight-faced, and walked away. We practice our words almost every day, and the kids are learning some more from road signs and the Spanish speakers here. Derek and I are learning too, not just Spanish vocabulary, but quieter lessons, like what the body of Christ looks like when it comes together in different skin colors and backgrounds and languages. We are also learning how blessed we have been. I am amazed at how easily I have taken hot showers and clean water for granted. I will update every week.